If you have any questions about the N2H information page below please contact us. 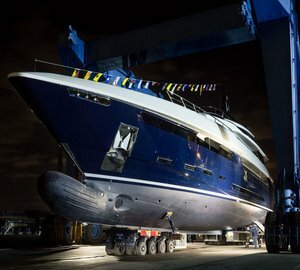 Motor yacht N2H is a luxury 48.50-metre vessel built and launched by Rossi Navi in 2017. Her unusual name N2H has a significant meaning and stands for "nice to have". Her wonderful dark blue hull and crispy white superstructure will surely turn heads at any port. She was designed by Team For Design - Enrico Gobbi and features naval architecture by Arrabiato and Rossi Navi. N2H's cinema theater is located on the upper deck, where there is also a spacious lobby with a staircase. Upper deck exterior area features seating on the aft and foredeck. The sundeck boasts a pool with a waterfall, a lounge area with a coffee table and a great dining table amidships. Guest accommodation is offered in 5 cabins. The main deck hosts the owner's suite with an office and fold-out balcony. Amidships on the lower deck, there are three double and one twin cabins. Powered by 2 CAT C32 Acert engines, N2H has a top speed of 15 knots. Her total fuel capacity is 30,000 litres, which provides maximum range of 3,300 nm at 12 knots. Motor yacht N2H accommodates 10 guests in 5 beautiful cabins. We do have available further amenity, owner and price information for the 48.5m (159' 1") yacht N2H, so please enquire for more information. The luxury yacht N2H displayed on this page is merely informational and she is not necessarily available for yacht charter or for sale, nor is she represented or marketed in anyway by CharterWorld. This web page and the superyacht information contained herein is not contractual. All yacht specifications and informations are displayed in good faith but CharterWorld does not warrant or assume any legal liability or responsibility for the current accuracy, completeness, validity, or usefulness of any superyacht information and/or images displayed. All boat information is subject to change without prior notice and may not be current.